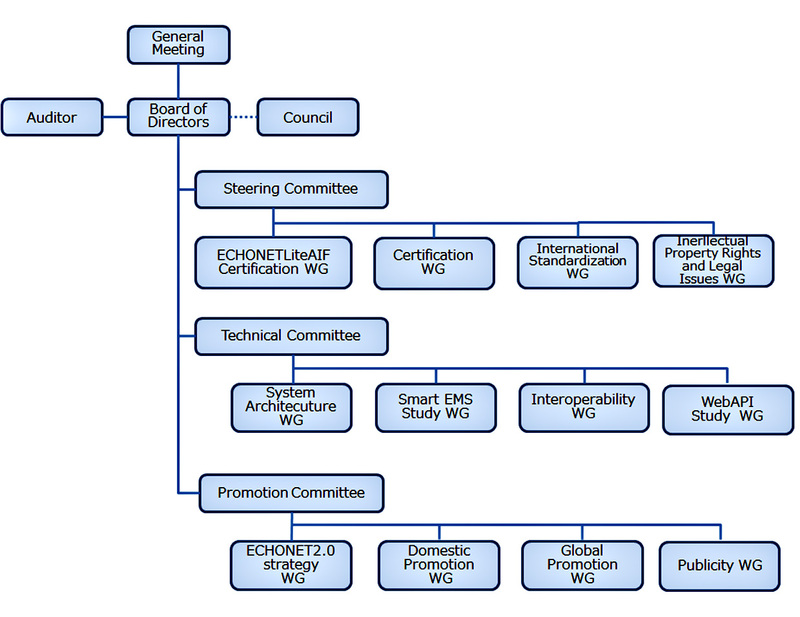 ECHONET CONSORTIUM activities are carried out by the three committees. Their objective: to develop standards for transmission media, which comprise the physical basis for the home network; middleware, which facilitates development of service applications; and service middleware, which performs linkage with external systems. The ECHONET Consortium was established in 1997 with the aim of realizing an affluent 21st-century society where people are in harmony with the environment. And thanks to the efforts and cooperation of all stakeholders, last fiscal year we were able to hold a symposium commemorating the Consortium’s 20th anniversary. ECHONET Consortium seeks to make positive contributions in areas such as CO2 emissions reduction, global environmental issues, energy issues, and the aging of society by promoting the standardization of home network infrastructure technology specifications, so as to enable interconnection of various vendors’ household appliances, residential equipment, sensors, controllers, and other devices. In 2011 we released the ECHONET Lite specifications, which are compatible with standard protocols both in Japan and abroad. Smart Community Alliance International Standardization Working Group, Smart house Standardization Investigation Committee recommended ECHONET Lite as a public HEMS standard interface in 2011, and in 2015 ECHONET Lite was approved as an international standard. Also, we formulated the ECHONET Lite AIF (Application Interface) specifications with the aims of improving interoperability between multiple vendors, and with the launch of a certification system in 2016. Now the installation of ECHONET Lite in various devices, mainly the eight kind of priority devices (air conditioners, storage batteries, hot water supply systems, solar power equipment, fuel cells, lighting, smart meters and electric vehicle dischargers and chargers), has increasingly become common. In addition, in 2017 we strengthened our partnerships with the Japan Electrical Manufacturers' Association (JEMA) and Japan Federation of Housing Organizations (JUDANREN), and have created the House Performance Catalog and worked to disseminate-HEMS and IoT smart home. . Thanks to the efforts of all our member companies, the number of ECHONET Lite specifications-compliant products exceeds 48 million units as of FY2017. At the same time, surveying the global situation, we see the impact of environmental pollution and climate change growing more serious and the need for countermeasures becoming ever more urgent. United Nations Summit has established Sustainable Development Goals (SDGs) to respond to these issues, and the Government of Japan has outlined “Society 5.0” as an initiative to realize the SDGs, aiming for a super smart society where cyberspace and the physical world are in harmony. ECHONET Consortium is in accord with these principles, and we are launching the new strategy ECHONET 2.0 to demonstrate a viable platform for the Internet of Things (IoT) so as to contribute to realization of a sustainable society in the coming age. Specifically, we will promote IoT networking, expansion of IoT applications, research and development on effective linking of services in the cloud era, and creation of mechanisms to deliver a wide variety of services. Through the widespread incorporation of ECHONET Lite and ECHONET Lite AIF specifications, we aim to pursue activities that contribute to realization of a prosperous and sustainable society. We appreciate the continued support and cooperation of all stakeholders. Engaged in a comprehensive range of activities to ensure the smooth, efficient operation of the Consortium. Responsibilities include planning, budget management, and administration of general assemblies and forums. Also responsible for organizing and coordinating committees and working groups. Engaged in the development of standards for the transmission media and middleware, which will be the building blocks of the next-generation network system. Engaged in public relations to promote acceptance of the next-generation network system developed and standardized by the Consortium. Also conducts surveys to make the system as user-friendly as possible.